There is a large gap between emotional and rational choices in a date such as November 20th, reminding us in time what truly matters when we rise above our daily issues and give in to the essence of life. Those born on this date carry incredible information in their heart that is often covered by layers of emotional bruises, unclear waters, and family patterns that won’t rest until they are seen for what they truly are. When Moon and Pluto combine in a row, it is always an intense emotional task that we must embrace, and lives of people born on November 20th will definitely be filled with emotional challenges that push them towards evolution and change. Their view on life might be a bit dark, after facing challenges of the real world, and their main topic to attend to is fear of death. Although this may seem a bit rough or too deep, especially at a young age, it gives them depth of perception, an old Soul, and an incredible power to change hate into motivation and love, and transform old, ancestral patterns into constructive life force that may create. Many obstacles could be found in their path, and trauma could color their world with grief. However, their task is to cleanse their heart instead of closing it in an attempt to be rational. This is a powerful time when all magic of life on Earth is in place, but only if one is prepared to take it in with all its painful messages along the way. "The King of the Fairies Approaching his Domain"
The symbol for this date also points out the magnificence and magic of this time, when incredible things can be ruled and used to create a zone of action that allows one to change their life. 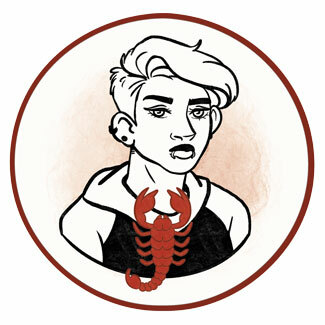 An intense symbol such as this one, connects what we typically see as feminine with a masculine figure and authority within, and speaks of one's initiative and creative flow with a proactive approach, in matters that are usually considered passive, circumstantial or too frail, dispersed and irrational to hold on to. 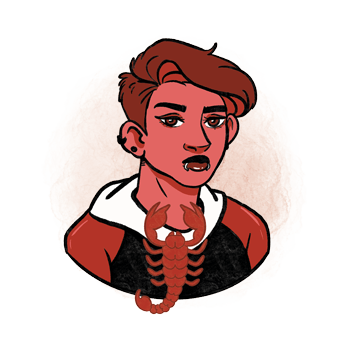 The first thing that a Scorpio born on November 20th must learn is how to set their personal boundaries towards the outer world, so they can remain flexible but stiff enough to not let negative intrusions of others in. They need to build their foundation, and to find themselves in their own personal space, in their own apartment, their own room, where no influences of other people's energies are found. They find their faith on mountain tops, in deserts, and where others don’t often wander to, with a purpose in life to find use in the most pressuring circumstances with pure faith that everything is just as it was always meant to be. Their deep emotional core pulls them into relationships like a magnet, stirring up patterns of ancestors as soon as they start relating to other people. On one hand, they have the wisdom of relating rushing through their blood and feel deep attractions that connects their physical world with their emotional impulses. This opens them up for the story of one true love, and keeps them in tune with the ideal of oneness with another human being. On the other hand, they could feel powerless in common romances, and be bruised by awakened sexuality when they intimately connect with the one they love for the first time. They need someone attentive and sexually aware, and won’t feel good in reasonable relationships where emotional connection doesn’t lead to pure creation as it should. To bring the weight off their chest, they are to separate from the world until they find peace in the core of their heart, so they can open up to another person with their boundaries nurtured and their vulnerable Self safe. They need someone to understand that their obsessive impulses aren’t controlling when love is found, and someone to give them enough space to recognize and act according to their deepest emotional needs rather than shove them aside to compromise. A person born on November 20th is a natural healer, someone born to make the deepest problems go away. They are energetically charged and need to use their inner wisdom to bring a deep sense of peace to their own heart, so they can be able to help others do the same. They make excellent alternative healers, work with bioenergetics and one's field of unconscious emotions, past life regression and so on. When they aren’t turned to extreme views and interactions with other humans, they excel in restauration, renovation, and banking. Black agate is a highly protective stone suitable for those born on November 20th. It gives grounding and calming peace, especially in times of bereavement. Getting one in touch with the emotional flow, it heals trauma and the sense of loss that could burden their world and keep them stuck in the past. It is a stone that helps decision-making that is authentic and clear of past influences, and helps with "tough love" issues that might push them one step too far. It is said to protect children from danger, and protects their inner child from toxic influences, enabling one to distinguish between false and true friends and relationships in their life. To choose a birthday gift for someone born on the 20th of November, you are to keep in mind that they will be happy with any small thing coming from the heart. They want the contact respected and valued, and don’t really need anything expensive or grandiose for as long as it resonates with their emotional world. Choose a crystal, a course in healing techniques, a shared therapy session that focuses on past life experiences, energy, psychology or evolutionary astrology, or simply pay for a massage that will release the tension in their body. Deep, compassionate, and healing, they are able to turn negative emotions into happiness and to teach others how to use their resources and painful situations for personal growth. In touch with Nature and cycles of the Earth, they have contact with great knowledge in their heart. Dark, overburdened by responsibilities that aren’t their own, they grow up before their time and lose joy along the way. When deeply bruised or abandoned, they become possessive, obsessive, and destructive, and might turn to cold-hearted aggression if they don’t heal their own wounds. In 1889 Edwin Hubble was born, an American astronomer and cosmologist, regarded as one of the most important astronomers of all time for his discovery that many objects classified as "nebulae" were in fact galaxies beyond the Milky Way. Despite his interest in astronomy, he honored his father and studied law until he got his Master's Degree and only turned to astronomy after his father's death. In 1959 Sean Young was born, an American actress, recognized for her roles in Blade Runner, Wall Street and Ace Ventura: Pet Detective. Before becoming an actress, she worked as a ballet dancer and model. In 1971 Joel McHale was born, an American actor, writer and comedian, known for portraying Jeff Winger on Community and roles in All the Time in the World and Ted. He received his bachelor's degree in history and joined the football team in college, before mastering in the Professional Actors Training Program at the University of Washington. 1805 – Fidelio, the only opera written by Beethoven, has its premier in Vienna. 1959 – The UN adopts the Declaration of the Rights of the Child. 1962 – The quarantine of Cuba in the Cuban missile crisis ends as the Soviet Union agrees to remove its missiles. 1985 – The release of Microsoft Windows 1.0. 1990 – The arrest of the Soviet Union's most prolific serial killer, Andrei Chikatilo (born on October 16th). 1998 – The first component for the International Space Station is launched.